Robert Aagaard and Company was formed over 40 years ago in Knaresborough nr Harrogate, and today we are widely recognised as a foremost specialist in classical chimney pieces crafted in traditional wood, stone and marble. The precisely measured moulding and meticulously detailed hand-carved decoration are hallmarks of the very highest standards of craftsmanship, and duly reflect the immense pride taken in the manufacture of every Robert Aagaard product. Our design service faithfully emulates chimney pieces of the seventeenth, eighteen and nineteenth centuries. In addition we offer, from stock, antique chimney pieces in wood, marble and stone, along with cast iron basket grates, hob grates and other ancillary accessories. Our handcrafted fire surrounds, are drawn from designs dating back to the seventeenth century and, lovingly crafted by highly skilled cabinetmakers and carvers, are available in a choice of woods. Each captures the beauty and delicacy of the finely carved flowers and foliage to achieve an intricate and classical form, so highly regarded by architects of the eighteenth century. Many fire surrounds can be produced in scaled-down sizes, enabling smaller rooms to be graced with all the timeless elegance of the original. A choice of fine marble from around the world is also available to perfectly complement every Robert Aagaard fire surround. 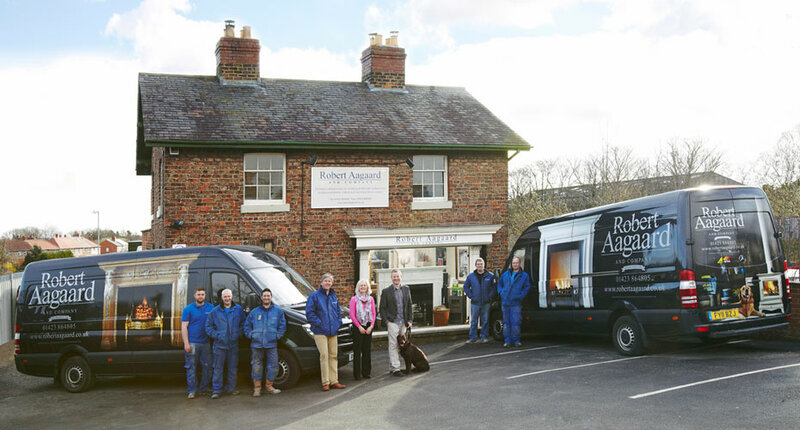 Meet the team at Robert Aagaard and Company outside our Knaresborough Showroom.